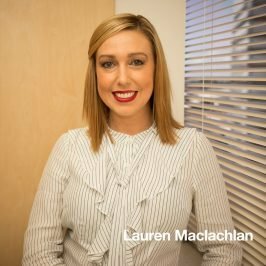 Lauren Maclachlan is the Executive Assistant to Sheena Vinden, Senior Partner, and is a Commercial Paralegal of the firm. She has extensive experience within the area of leasing (both retail and commercial) and assists in transactions involving sale/purchases of businesses and companies, preparation of corporate documentation and other business and company related documentation. Lauren is also highly involved in the Retirement Village area of the firm and assists with on-sale and leasing transactions. Lauren has particular interest in leasing and has focused on this area of law for the past 8 years. In her spare time, Lauren enjoys going to the movies, road trips exploring the North and South Coasts, and spending time with family and friends. Lauren was proposed to by her boyfriend on Splash Mountain, Disneyland USA and then married at the same place in 2016. She competes in yearly BJP Physical Culture Competitions throughout NSW and has done so since she was 7 years of age.